Dozens of dirt bikes and ATVs zipped in and out of city streets in Lakewood and Cleveland Sunday night. Videos surfaced on social media showing ATV and dirt bike riders zooming past moving traffic. News 5 cameras caught one driver downtown being arrested by police. "When you have 100 operating illegally on the road, it's almost impossible for police to wrangle everyone," said Cleveland City Council member Kerry McCormack. Cleveland EMS responded to a call for a man that fell off his dirt bike on Huron Road. He was taken to MetroHealth Medical Center. In downtown, ATVs were spotted taking up entire lanes. McCormack called for police to use intelligence to stop these groups before they hit the road. 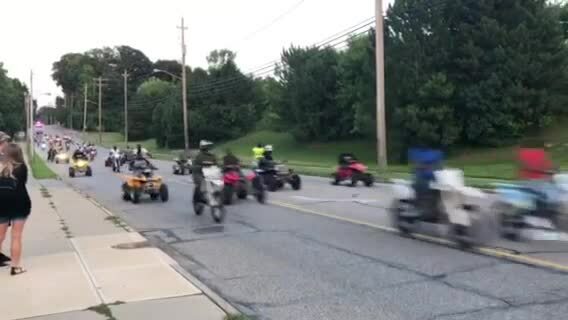 ATVs and dirt bikes were seen on Clifton Avenue in Lakewood. 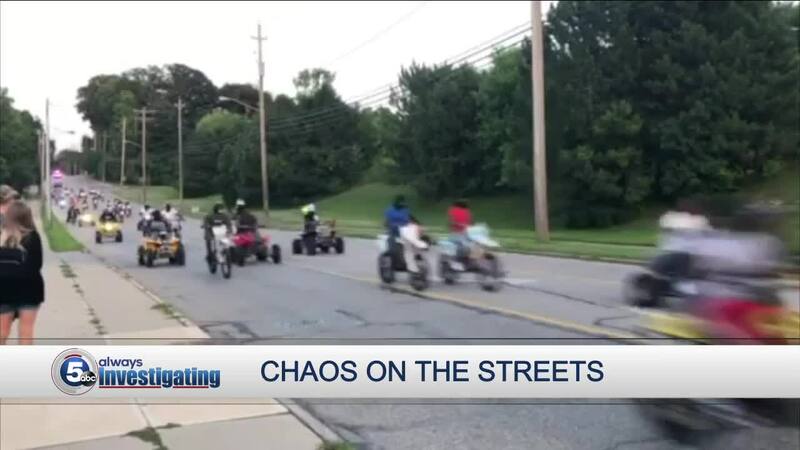 Police said a group of about 100 dirt bikes and ATVs were traveling "in a reckless manner" and disregarded traffic signals, according to the report. The Ohio State Highway Patrol assisted police with stopping the drivers. The drivers refused to stop for officers who attempted traffic stops, according to police. Law enforcement blocked cross traffic at some Lakewood intersections in an effort to protect motorists from colliding with the dirt bikes and the ATVs. "They are putting everybody in jeopardy," Lakewood Police Chief Tim Malley said. "For nobody to get hit or involved in an accident, it is really kind of remarkable." In total, five people were arrested. One witness reported seeing at least 40 dirt bikes and ATVs in Cleveland's Warehouse District near the Flats East Bank around 9 p.m. The dirt bikes on city streets have been a growing concern among business owners and residents. Last year, a business owner reported seeing at least 200 riders swerving around cars and driving into oncoming traffic. “Kind of like anarchy out there with these kids. It’s gotta be stopped,” said Smedley’s Bar and Grille owner Sean Mettler.